Nowadays, listening to music on the go is something that most people take for granted. For decades, people have been listening with headphones that “get the job done” but don’t necessarily excel at anything specific. Gone are the days of clunky wired headphones that commonly tangle and become more of a hassle than they’re worth. Today, wireless headphones are commonplace, but truly wire-free headphones are starting to become the norm. Ever since Apple’s AirPods, manufacturers have been slimming down their designs and upgrading with a more minimalist approach. Take the new SoundPEATS Q45 TrueShift for example. Their design is minimal, tangle (wire) free, and quite convenient in many different aspects. Needless to say, their design looks great from afar, but is it really? Do these earbuds offer comfort in addition to decent sound quality? 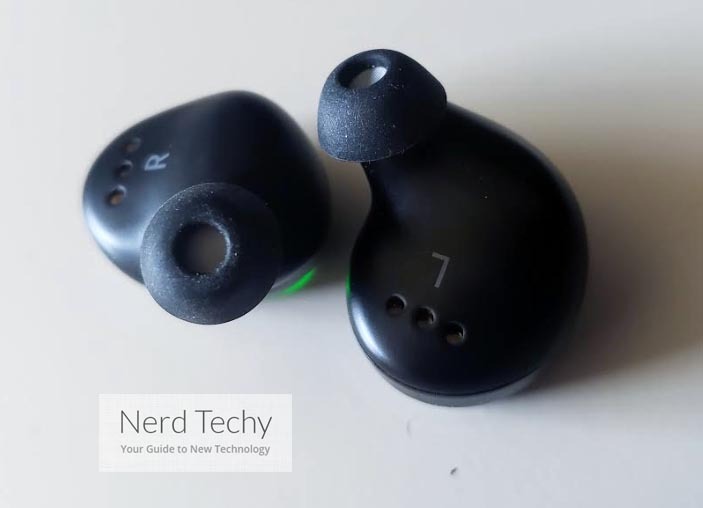 We’ve gotten our hands on a pair and are here to delve into their features to see if their worthy of an investment from the average music-lover. Upon their arrival, we were very excited to rip open the box and see what the TrueShift earbuds were packed with. In the small box, there’s everything you need to get started. They come in a small charging case that measures 2.25″ x 3.25″ – just tiny enough to fit nicely in any pocket. Open the case up and you’ll see the two earbuds independently resting in their charging cradle. Pick each one up and you’ll notice a magnetic attachment that keeps them sturdily in place when not in use. While not immediately obvious, this is where the earbuds will securely rest while not in use, all the while keeping their internal batteries topped off. Tip the charging case to the side and you’ll notice two ports. There’s a USB-A connection on the left side and a USB-C connection on the right side. Why two ports? 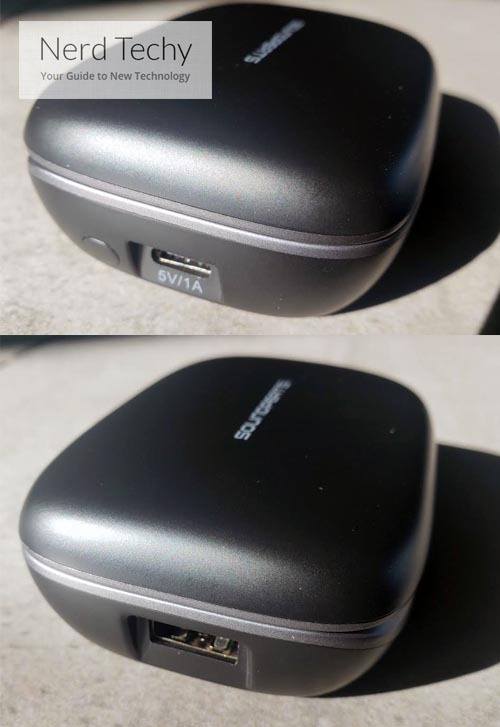 Well, since the cable they’ve included is a USB-A to USB-C charging cable, you can charge from either direction, giving you the option to connect the case to a multitude of charging devices. Think of this small case as a power bank. 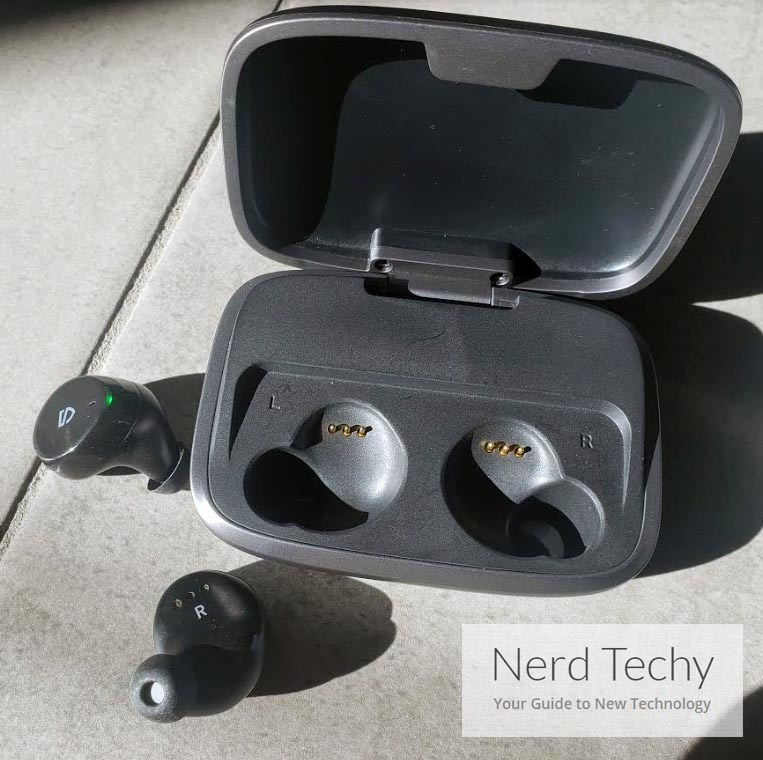 There’s a small lithium-ion battery within it that’ll give up to 22 full charges for the earbuds when they’re resting within it. The case is designed to keep them protected at all times while maintaining full battery power to the earbuds. The front of the case contains two tiny LEDs that indicate the battery status. When you open the case, you’ll see these two LEDs emit either a green or white glow. Green means that the battery is fully charged and ready to go. White will indicate that you need to plug in the USB cable and charge them. While charging, the LEDs will stay solid white when they’re actively charging, but turn solid green when they’re finished. For extra convenience, the charging case can also be charged wirelessly by placing it on a charging pad that typically charges smartphones. 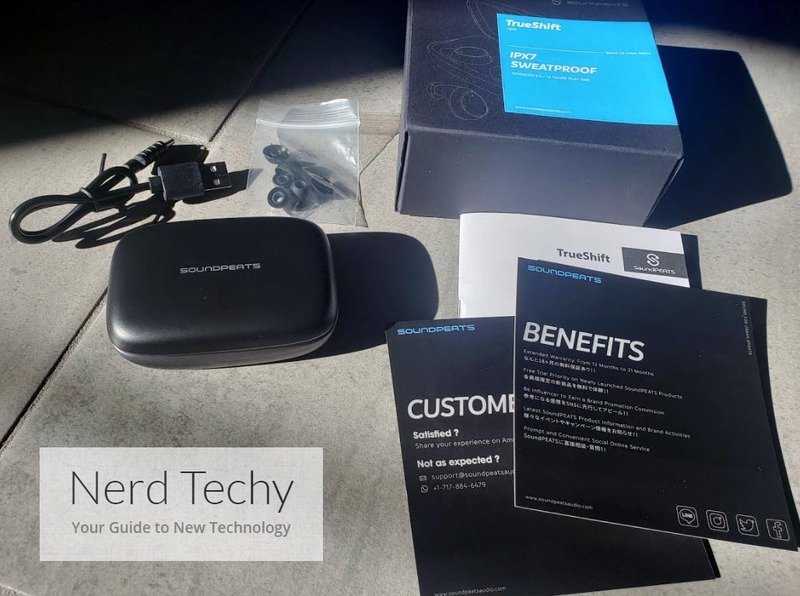 In addition to the charging equipment (USB cable and case) and of course the earbuds themselves, SoundPEATS has also included extra ear tips, a detailed user manual and a customer care card. The extra ear tips are essential for achieving a proper fit. Before you fully immerse yourself into your music, take a second to swap out the pre-installed ear tips if you feel like there’s too much wiggle while the earbuds are in your ears. A correct fit goes a long way as it’ll help keep out unwanted background distractions and keep you more focused on the music you’re enjoying. The user manual is quite detailed and seems to cover literally anything that you might need to know about the TrueShift Q45’s. They’ve even thrown in a small card labelled “customer care” that helps you get in touch with the company if you have any concerns or questions. We’ve mentioned it previously, but achieving a proper fit is definitely crucial. Make sure you play around with the ear tips and select your preferred size. Picking up the earbuds out of the charging case for the first time, you’ll immediately notice the minimalist approach that SoundPEATS took when designing the TrueShift. Each one is labelled “L” or “R”, clearly indicating which one is for your specific ear. The tip of the earbud should be pointing downward towards your ear canal while the main body should be snuggly pressed into the cavum of your ear. When you do so, you should feel no pressure points or discomfort. It’s quite amazing how snug they fit. You can wiggle and shake your head violently and still, they won’t come out! The snug fit is ideal for activities like basketball, running or biking, where you’ll encounter swift movement and agility that could potentially knock them loose. In our experience, this wasn’t a problem. We would purposely try to knock them loose, but no matter what we did, they stayed snug within our ears. While it may not seem that obvious at first, SoundPEATS took special care in designing them to be “not too big” but also “not too small”. We even had 5 separate individuals try them on and everyone seemed to agree; the fit is universally good no matter the ear they’re in. When we first removed them from the charging case, they began to blink continuously, indicating that they were looking to pair. Immediately we heard a voice prompt that stated “power on” and the green LEDs would flash 3 times quickly. At this time, both of the earbuds paired to each other as we selected “SoundPEATS TrueShift R” on our mobile device. One tap and they were both connected. Apparently, this is known as “stereo mode” where both earbuds are simultaneously in use. Likely, this is how most listeners will use them. However, there’s another mode called “mono mode” that lets you listen to one independently from the other. To understand mono mode, the right earbud defaults to master and the left one is slave. Once you open the case up and the earbuds go into pairing mode, you’ll hear the voice prompt say “power on” while the LEDs flash quickly 3 times continuously. At this time, select “SoundPEATS TrueShift R” on your device, just like they did for stereo mode. However, when you’d like to use the left earbud separately, take out the right earbud, place it in the case and close the lid. 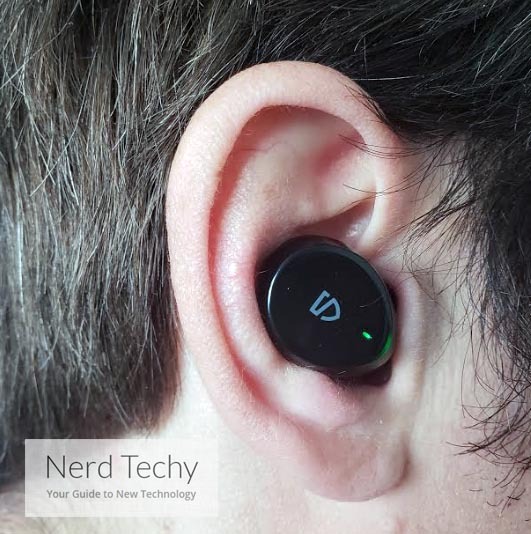 At this time, “long press” the left earbud and you’ll see “SoundPEATS TrueShift L” pop up on your device’s list of available Bluetooth connections. It’s pretty easy! If for any reason you encounter difficulties with pairing, it might be a smart idea to do a factory reset. To do this, simply place the earbuds back into the case and “long press” the small button next to the USB-C charging port (the force pairing button) for 5 seconds. By doing this, the LEDs will stay solid white, indicating a successful factory reset. To force a disconnection, simply open up the charging case and long press this same button for 3 seconds until you see a solid white glow from the LEDs. As far as headphones go, sound quality is likely the one thing you’ll need to be impressed with the most. SoundPEATS started with an awesome design and then built all of the internals to provide captivating sound for any listener. Once you’ve achieved a fit that you’re happy with, tuning into your favorite music is the best way to experience them. We played a wide range of tunes through the TrueShift Q45’s and would rate the overall sound quality at a solid 7 out of 10. The sound is quite decent, but lacking a bit when it comes to bass and depth. Like most earbuds, the physical limitation of their size means that sound quality can be a bit lackluster compared to over-ear or noise-cancelling headphones. This is totally understandable since manufacturers are restricted to such a small and compact size. However, don’t let that deter you too much from them. We’ve tried hundreds of different true wireless earbuds in the past and none of them can truly compete with larger designs. With the TrueShift Q45’s, we played rock, rap, country, classical, pop and even jazz through them. While the bass and depth left us wanting a bit more, we didn’t have issues with clarity or distortion. It seems that even when you crank up the volume to its maximum, they are capable of producing nice sound in almost any scenario. These are designed for an active lifestyle, so music while you’re working out or on the go doesn’t necessarily have to be at the same caliber as a pair you’d wear for listening while you’re at home or in the studio. Charging these earbuds is a piece of cake, thanks to the case, and the actual battery life capabilities are quite impressive. We’ve gone a solid 4 hours between charges until we noticed that they needed to be placed back in their charging cradle. Since the case is capable of around 20 individuals full charges, it’s easy to achieve several days worth of listening without the need to charge-up the case with the included USB cable. It seems every year batteries get more efficient – it’s good to see earbud manufacturers continuously upgrade the batteries to meet today’s standards. 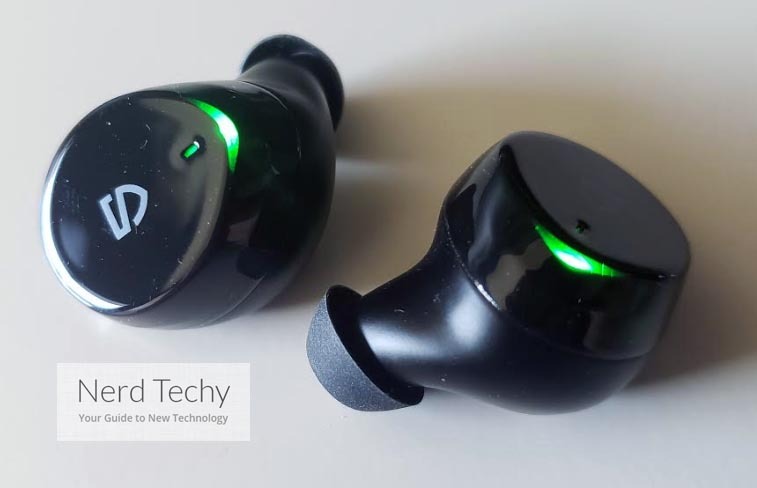 After testing the SoundPEATS TrueShift Q45 for several continuous days, we must say that overall we’re very impressed. Their simplistic design and portable yet efficient charging case makes them a smart choice for anyone looking for excellent value and quality. Yes, they’re not full of deep bass, but the actual clarity of sound that emits from them is top-notch. SoundPEATS includes everything you need, including easy-to-follow documentation so you’re fully aware of their abilities and functionality. What’s even better is that SoundPEATS is a company that’s been around for quite some time now and their credibility as a headphone and audio manufacturer is growing each and every year. 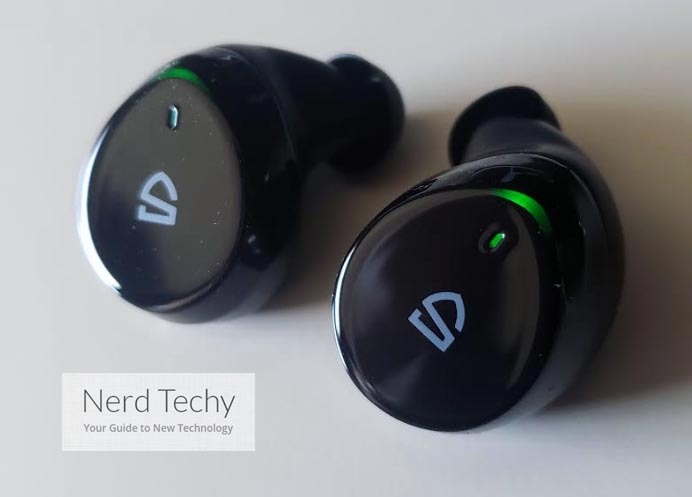 They’ve even included a 12 month warranty period to give listeners better peace of mind knowing that they’re covered in the event of a failure due to any manufacturer defects. 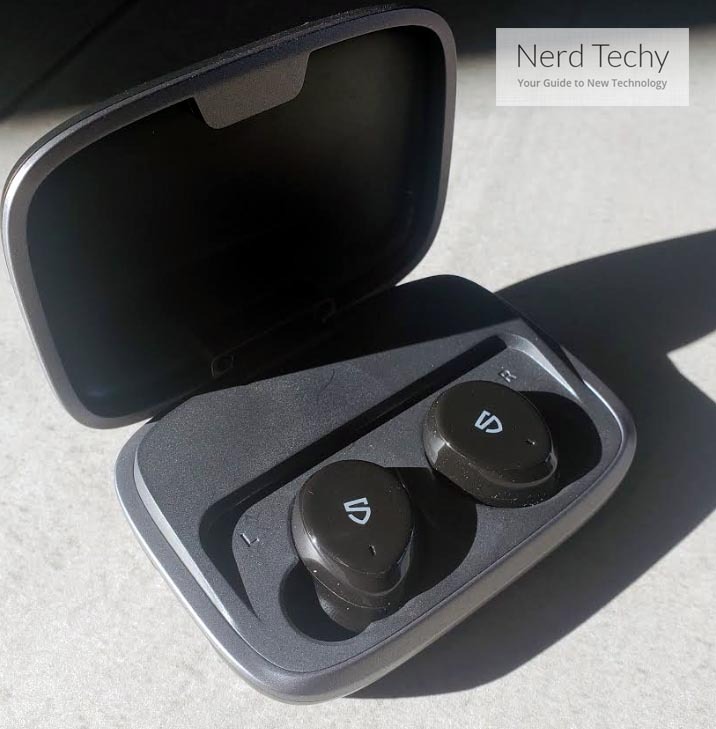 If you’re in the market for true wireless earbuds that provide great value, look no further. If you’re wanting something with more bass and depth, take a glance at the SoundPEATS A2. They’re not the kind of headphones you’ll want to work out in, but they’re capable of high-end sound at a low price-point. Have you tried the new TrueShift Q45’s? What’s your take on them? We’d love to hear from you in the comments below! Is there any latency with iPhone?